RECIPE: Miso soup with spicy bok choy wontons. Sure, it was one of those weeks that started with me taking a (mild) tumble on my bike. Time in the kitchen this week has been much more fulfilling. It’s the recipe that’s new and mysterious, like that hot exchange student in high school. Lemongrass stalks. Never used before (and, even organic, they only cost me 54 cents!). 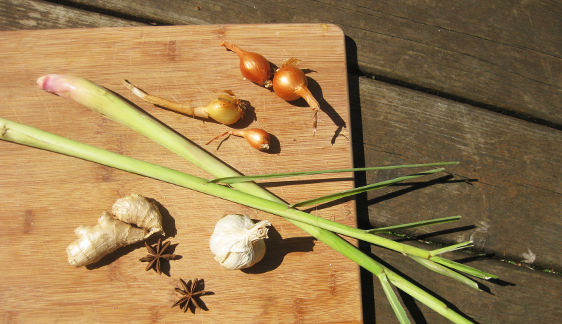 So these ingredients, plus an onion and cloves and peppercorns, etc. created the broth. Meanwhile, there were the wontons to tackle, which were inspired by needing to use all the bok choy in Ken’s garden — which was starting to bolt. 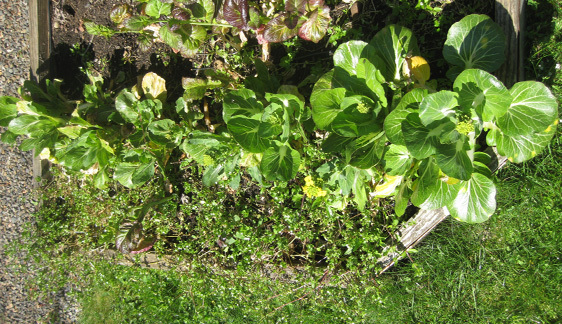 (Even though my mother has stated that bok choy is just for feeding their grandson’s tortoise, I love it.) Bok choy ribbons plus cayenne and toasted sesame oil. No, I didn’t make the wonton dough; I bought a package of wrappers. Easy. 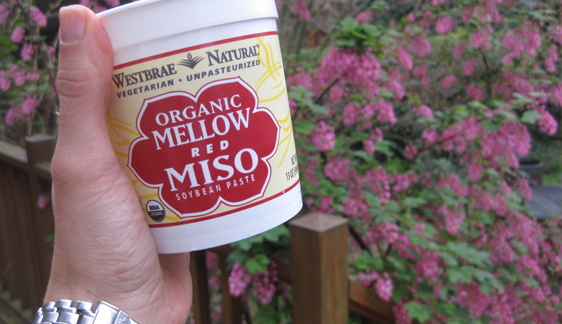 And added another ingredient to the broth: miso, a fermented bean paste. Hey. Don’t turn your nose up at miso. 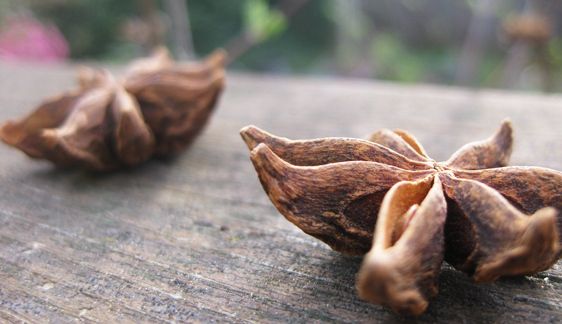 It’s a standard item in Asian kitchens and is touted as a fantastic protein, digestive aid and full of B-vitamins. More? It helps detox your system, boosts your immune systems and is high in antioxidants. And you can totally use it in soups, dressings, sauces, etc. Learn to love it. I know I will. So my broth has been strained and I added the beloved miso, scallions and dropped in these wontons. The result? A rich, spicy, satisfying soup. Which is a welcome remedy to stupid bike spills. RECIPE RATING: 5 of 5 glasses of chilled white wine. Ahh. Heat the oil in a large pan over medium heat until shimmering. Add the onion, season with salt, and cook, stirring occasionally, until just starting to soften, about 2 minutes. Add the ginger, stir to combine, and cook until fragrant, about 2 minutes. Add the remaining listed ingredients and stir to combine. 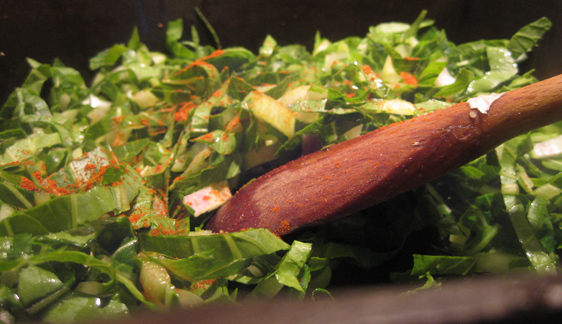 Bring to a boil, reduce the heat to low, cover, and simmer until the vegetables have softened and the flavors have melded, about 45 to 60 minutes. Meanwhile, wash and prep your bok choy, shallots and garlic. Heat the oil in a medium frying pan over medium heat until shimmering. Add the shallots and garlic and cook, stirring occasionally, until the garlic is lightly golden brown and fragrant (take care not to burn the garlic), about 5 minutes. Add bok choy, soy sauce, and cayenne and stir to combine. Cover and let the bok choy cook for 2 minutes. Uncover and cook, stirring occasionally, until most of the moisture has evaporated and the bok choy is softened but still bright green, about 1 minute. Remove from heat, drizzle with the sesame oil, and stir to combine. Place 1 or 2 wonton wrappers on a clean, dry work surface. 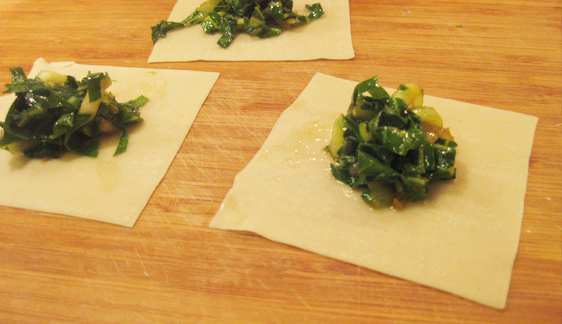 Place a teaspoon of the bok choy mixture in the center of each wrapper. Wet your finger with water and use it to moisten the perimeter of each wrapper. Fold the wrapper in half to create a rectangle and press the edges to make sure they are well sealed. Pull the folded corners of the rectangle together over the center of the filling so that those corners overlap slightly and press the ends together until sealed, moistening the wrapper as needed so that it adheres. 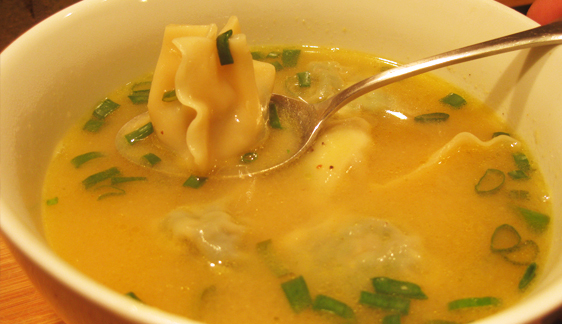 (We actually tried several wonton shapes, and they all held up in the soup.) Repeat with the remaining wrappers. When the broth is ready, strain it through a fine-mesh strainer into a large bowl; discard the solids. Wipe out the saucepan, return the broth to the pan, and bring it to a gentle simmer over medium heat. Add the miso and hot sauce and whisk until completely incorporated. Taste and season with salt and pepper as needed. Add lemon juice and 3/4 of the scallions. Taste and add more hot sauce, salt or pepper as needed. 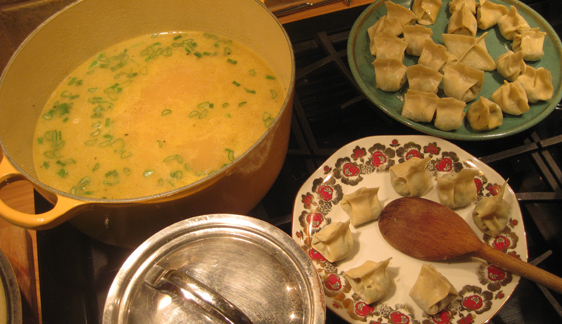 Divide the soup and wontons among serving bowls and garnish with the remaining scallions. This entry was posted in 5 Wine Glasses, Dinner, Lunch, Vegetarian and tagged bok choy, miso, soup, spicy, vegetraian, wonton. Bookmark the permalink. Those wontons look complicated but oh-so-delicious! and YOU were so that hot exchange student in the Australian high school.